Despite the huge variety of possibilities in modern smartphones, they still continue to perform the function for which phones were initially created - mobile communications. The functionality of this function is provided by a SIM card inserted into the special slot (and even several). However, it is not uncommon for new and already used smartphones to have problems with communication - Xiaomi does not see the SIM card. This problem has several causes, and their most accurate detection is very important in this case, since further actions depend on them. These cases are good because most often the user can independently deal with this problem without resorting to the help of specialists. If the necessary sim card in the shutter does not work at all, then it makes sense first to check if the slot itself is disabled in the settings. Perhaps the Xiaomi Mi4 or another device turned it off to save power, or there was a trivial malfunction in the operating system. By the way about the failure - did you try to reboot? A huge number of cases when stable "roll-over" of the slot is solved by a single reboot of the phone, after which the problem no longer bothers the user. Is there a network? Perhaps, wherever you usually walk or work, the operator does not have coverage, and the connection is so bad that the slot is completely disconnected. For the efficiency of SIM card slots in the Android operating system, the modem answers - a small firmware, which is completely independent. It comes with any firmware, but it can be changed separately, without flashing the smartphone completely. It is necessary to find the version of the modem that is different from the current one (you can see it in the Settings, the information about the phone). Installing the modem requires TWRP. The firmware of the modem is relatively universal, since the models similar in production to Xiaomi have the same hardware, but it is still desirable to look for versions for your device. Put the downloaded file into the root of the memory card, reboot into TWRP and flash the modem through the Install menu. Perhaps the slot's performance will not be restored with the first flashing, try several versions of the modem. If the slot has stopped working after the next update of the operating system, then it makes sense to look for the firmware version of the modem from the previous version. 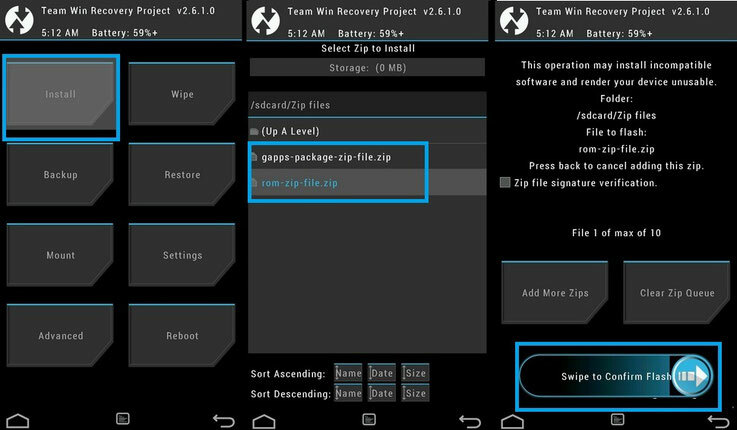 Very well, if there is a backup copy of Android in TWRP, because there, most likely, the memory cards worked fine. "Curve" installing a new firmware may damage the Nvram partition. This piece of firmware contains the most important information about SIM card slots - IMEI. If it is damaged, Xiaomi Redmi 3S does not see the inserted SIM card. There are several solutions - it's the easiest way to restore this partition from the full TWRP backup, if it exists. You can try to replace Nvram, using the data of another phone of a similar model, and then restore your own (the restored partition must be saved). Reset the smartphone to the factory settings, having previously reserved all the important data. Completely reshare the phone using another firmware (it is desirable to find the version earlier, where the sim card still worked). A very rare case - the sim card "falls off" when the phone turns on 3G or 4G. Contact the operator for assistance in setting up the phone in detail to use the Internet. Hardware nuances arise on new devices (most often this is a normal marriage) and on already used (perhaps the phone had time to fly somewhere or swim). Some nuances can be eliminated on their own, but more serious ones require knowledge of the case. Does the SIM itself work? Perhaps she had been lying idle for a long time, and the operator turned it off. Contact the call center to solve this problem. The sim card can be very old, the contacts are damaged or oxidized. Try to clean them with a cotton swab dipped in medical alcohol. Also check the contacts on the smartphone itself - if necessary, perform the same operation with them, using the minimum amount of alcohol to prevent it from swirling inside. Is the card firmly in the slot? Replace the card from the operator or repair the slot by contacting a specialist. Perhaps you have a version of the device, in which the modem does not support local mobile frequencies. This often happens when ordering a phone directly from China, which, accordingly, have a hardware configuration different from the export models. There's nothing you can do - negotiate with the seller. Often there is a nuance on new devices - a normal marriage. Please contact the store where you bought the phone, let experts know about it (if the phone, of course, under warranty). Repair will not give up, of course, but with the guarantee is free. It is better to require a full replacement of the device - more likely that the problem will not make itself felt again. If the above tips do not help to solve the problem, then, most likely, the matter is more serious. Phone stuffing may be damaged, some sort of postings or a loop may be damaged (this is usually manifested by some symptoms other than SIM card slots). It is advisable to contact an authorized service center for people who know how to fix these phones.